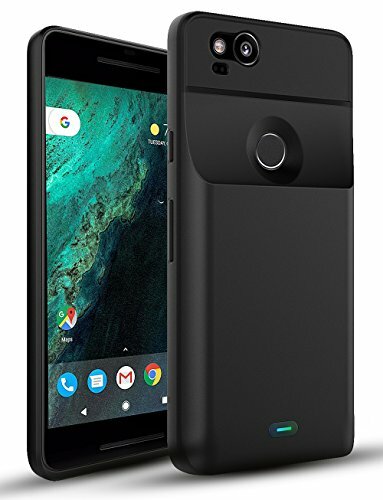 The CASESSARY Google Pixel 2 battery case provides you fast charging and full protection. Made with ergonomic anti-slip and durable design to protect against drops, bumps, scrapes, scratches and hard falls. 1.Build-in high-capacity lithium-polymer battery, double the standby time for your Google Pixel 2. 2. Premium material to protect your phone, charging and protecting 2 in 1. 3. USB OTG data support, enjoy fast data transfer without removing the battery case. 4. Integrated safety features with temperature control, effectively avoid short circuit or overcharge even under extreme conditions. ★ Please use original charger or compatible charger to ensure recharging speed. ★ Do not expose this battery case to moisture or liquid. ★ Do not place battery case to fire / excessively hot environment. ★ The surface of this battery case may gradually become warm when charging. If there's any problem when using our devices, please kindly contact us with the contact info enclosed on the service card, we are always here to help. ★ 【STAY CHARGED ANYWHERE】: World's 1st and ONLY fast charging Pixel 2 battery case, with a long last 3900mAh Li-Polymer battery (>800 Life Cycle). Built into perfection with all features you need. ★ 【FULL 360° PROTECTION】: Designed with perfectly raised bezel, ergonomic anti-slip pattern, cushioned frame and rugged outer-shell. Provides superior protection against drops, hard falls, and scratches. Plus premium patterned surface with anti-slip features. ★ 【PRIORITY PASS-THROUGH CHARGING + OTG DATA TRANSFER】: Your phone will receive full-charge 1st and then begin to automatically re-charge the case in less than 2 hours. Plug-and-Play technology allows easy data-synchronization without having to remove the case. ★ 【DYNAMIC POWER MANAGEMENT】: Protect phone's battery life by optimize the charging speed when battery is empty or close to full. Sophisticated protective logic+ temperature sensor, prevents your device from over-heating / over-charging. 4 colored LED lights indicate an accurate power level. ★ 【WARRANTY】: Money Back Guarantee and Extended 2 Years Warranty. Upgrade to Lifetime Warranty by following @CASESSARY on Facebook, Twitter and Instagram. If you have any questions about this product by CASESSARY, contact us by completing and submitting the form below. If you are looking for a specif part number, please include it with your message.